I know it’s been a while since I’ve posted here. I have been dreaming of cakes and cookies to share with all of you! My children are noticing the lack of sweets around here these days! My daughter mentioned she’s pretty bored with my different versions of banana breads, apple cakes and crostatas. I even haven’t impressed them much with my chocolate chip cookies! What’s a baker to do!! I did know I had something to look forward to with our new #TwelveLoaves bread baking challenge. A new challenge meant something different had to be created to share with all of you! This month, the #TwelveLoaves bakers are baking with CHERRIES! #TwelveLoaves June: Cherries. The month of May was filled with lovely onion breads! We have chosen cherries for our June theme. Choose a recipe including cherries (fresh, dried, canned, jam, or preserves). Whatever you bake, (yeasted, quick bread, crackers, muffins, braids, flatbreads, etc.) have fun and let’s have a delicious month of bread with cherries. Let’s get baking! What in the world took me this long?!? Trust me, it won’t be another year until I bake this sweet bread again! My daughter knows I share our baked goods with our neighbors. Let’s face it, I sometimes bake a lot here and there is plenty to share with everyone! This bread was not lasting that long. There weren’t that many pieces to give out. I barely finished photographing it and slices were being tugged away from my little photography area left and right! Cherry juice was drizzling everywhere and my daughter warned me she would tackle me if I even dared attempted to share a slice with anyone. This recipe was a keeper! recipe notes: When I was putting the bread together, I didn’t want to press the cherries too deep into the dough. Afterwards, I thought maybe the cherries would fall off the bread and wished I had pressed them a bit more. As the bread was baking, it rose nicely and the cherries found their spots. I didn’t add all the cherry syrup on the bread before baking. I did reserve some for the end after I removed it from the oven. You can add as much or as little cherry juice on according to how sweet you like your bread. The focaccia was fluffy and soft with sweet cherry bites. A lovely slight crunch from the almonds…I really couldn’t be any happier with this recipe!! a small bowl, add the water and sprinkle the yeast on top of the water. Add 3 tablespoons of the oil and whisk together. Set aside. In large mixing bowl, add the flour and 3 teaspoons of salt; whisk together or mix together on low speed in your mixer. and add the remaining flour. Mix on low speed for about three minutes. until you obtain a softer dough. doubled in size (about 1-1 1/2 hours). Tbsp. oil. Press dough evenly into pan, leaving a 1 1/2-inch border. draft-free area until puffed but not doubled in size, 45–50 minutes. occasionally, until mixture is reduced to 1/3 cup, 8–10 minutes. Transfer to a small bowl; let cool completely. Tbsp. oil. Scatter cherries over, pressing them gently into dough. Drizzle reduced syrup over, allowing it to pool into nooks and crannies. wire rack for at least 15 minutes. Serve warm or at room temperature. What a gorgeous focaccia Lora. And I know what it is like to finally make a recipe you have been saving for years. This one is definitely a keeper and should be made. Such a funny thing Lora! Focaccia would have been the other option if my buns wouldn't have turned out good! What a spectacular focaccia, Lora!!! Totally swooning at this combination!!! I kid you not, I have magazines that are up to 10 years old with recipes I'm still "meaning" to make. Sigh. This focaccia is gorgeous! 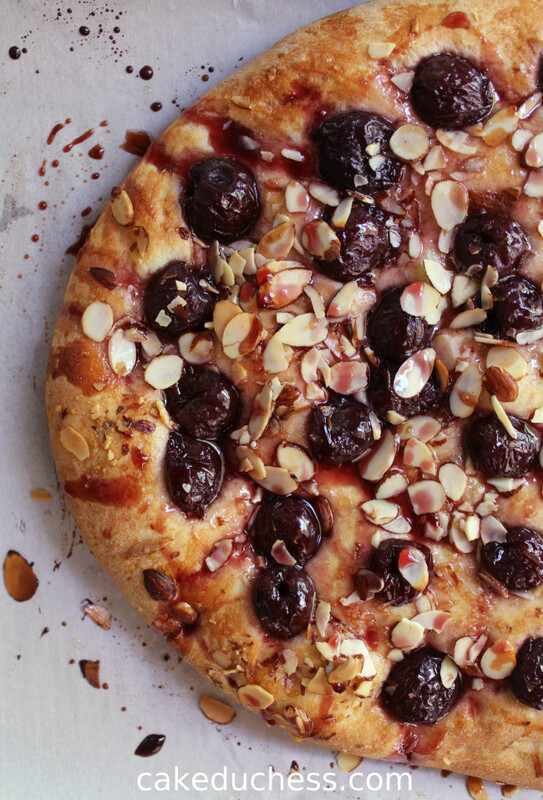 I've made a cherry focaccia before, but this cherry-almond topping is miles above it – absolutely mouthwatering, Lora. Oh I love this! The pictures pull you right into the screen with great disappointment when our noses are met with a hard-bright light and the surface of our computers. I wish I was your neighbor. I do have a great gluten free focaccia recipe that I will slapping some cherries on with the help of your inspiring recipe. Have a lovely day Lora. Adore this! I miss baking with you guys…I will have to rejoin the group! 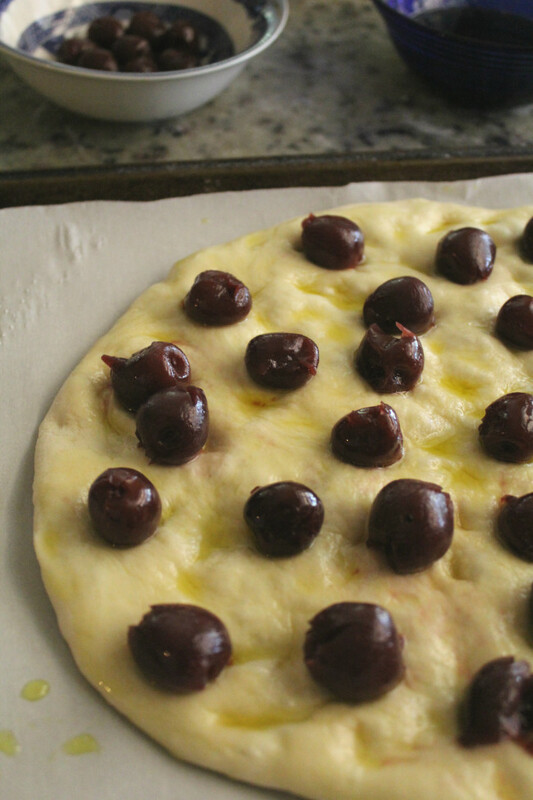 love how you kept the cherries whole. . they look so beautiful and elegant on top of this focaccia! delicious! totally trying this and first, that Focaccia recipe!!! love! I would love a piece of this focaccia right now! Oh manna from heaven! I just bought cherries last week at the Farmer's Market. Looks like I need to get more. I find older recipes from magazines and end up making them a year or two down the road, which is my excuse for keeping them all. 🙂 Beautiful focaccia!! I wish we were neighbors. Oh my! I was drooling over the photo of this focaccia before I even read the content of this post! Love this idea and incorporating fresh in season flavors such as cherries! Delish! This looks and sounds AMAZING!!! My husband will love this!! I'm going to make it for him sometime 🙂 He loves cherry! Gosh Nick Malgieri does have incredible recipes and I can completely related having your eyes on a recipe only to make it two years later. Great that you did and shared, Lora. I can completely see why your kids were "tugging' at it and the pieces disappearing one by one. Lora, I've missed you! I've been checking your blog weekly hoping for a new post from you. I'm so excited that you're back with this sweet version of focaccia. I've been wanting to make sweet bread for a long time. 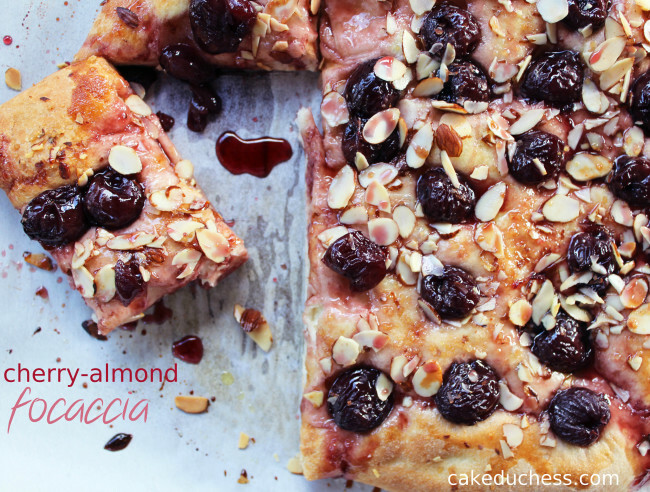 This looks so beautiful – your cherry almond focaccia is perfection! I don't blame your daughter at all for eating the whole thing. I would too! Cherries are my favorite, so I'm absolutely loving reading these posts! This foccacia looks like it's to die for! Yum- I love focaccia, and this is even better with cherry and almonds in it! Oh I love the idea of a sweet focaccia. I've never tried that and see why your family are this so quickly. It's gorgeous! 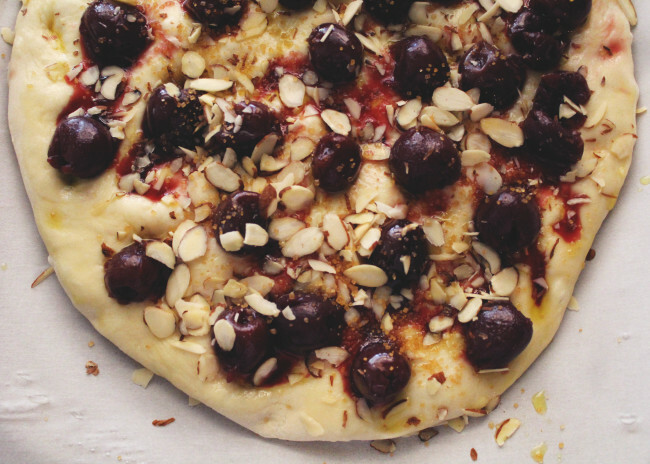 Your cherry focaccia looks absolutely amazing, Lora! I love the red studded around as well as the toasted almonds. No wonder there wasn't any left for the neighbors! This looks so scrumptious! Thank you for a wonderful recipe! This looks absolutely wonderful. Love all the cherries! Oh man this looks amazing! Cherries are my favorite fruit…yum! Holy cherries! I am positively swooning over this focaccia! I love cherries and usually eat them all before using them in a recipe – But I'm going to need some super strength will power to make this focaccia happen! Wish me luck! I'm hopping on over from Liz at Skinny Chick–this is such a fun idea, I can't believe I hadn't heard of it earlier! I looove bread and monthly challenges where folks get to gather to make awesome themed goods sounds absolutely lovely. Do you have a newsletter to announce the monthly themes when they come out? It'd be a blast to participate in a future one 🙂 and your blog is definitely on my radar now! Second of all, cherry focaccia is such a great idea! I tried it once years ago with cherries, apricots and rosemary, and I practically ate it in one sitting. But I completely forgot about it, so I'm glad I stopped by because you reminded me that I should make it again! I think I will try making mine with pitted fresh bing cherries, or even frozen bing cherries. This looks gorgeous! 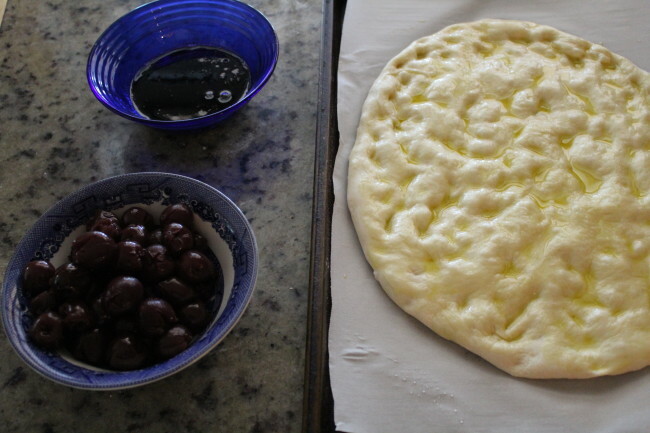 I've never made a sweet focaccia…I think that needs to change! I have never really though of focaccia in a sweet way but you have certainly opened my eyes to a whole new world. I can't wait to try a sweet version with cherries. Also, your photos are to die for, and would look great in a cookbook. I almost missed the party this month but I'm glad I made it just under the wire. Thanks for hosting the party. Your focaccia looks delicious. Cherry and Almonds are an amazing combination. Hopefully it won't take me two years to try this! I found you through Bakewell Junction, and I would love to link up with you #twelveloves bakers this month (July). What is the theme and how do I join up? What a gorgeous focaccia, I know I wouldn't want to share either ;). If you only knew how much I love both cherries and focaccia Lora! Can't wait for cherry season here, but there are many more months before that happens. I might steal the recipe for the dough, looks amazing!